Exactly a month ago we cooked our last state meal. I know, I know…I’m really slacking here. But I have an excuse for why it took so long…sort of. When we cooked our Connecticut meal, you may remember that we had guests for that meal, our friends who were trapped at our house during an intense thunderstorm. Well, after we ate, we had our friends’ eight year old son pick the next state out of the hat for us and he picked…Montana. It was inevitable that we would be left with a lot of states with cuisine that we have made already. Montana’s state foods include elk steaks, bison burgers and pasties, all of which we made for other states. The good news for Montana is that its most iconic food, the Huckleberry, was not among the already made foods list. And the list of recipes for huckleberries was a mile long. I’ll probably end up getting a phone call from my brother about this, but I can’t pass up the opportunity to mention that before he was born, my sister and I took to calling our brother “Huckleberry” in utero, “Huckle” for short. It had something to do with the Richard Scarry books. Cute for a baby bump, but unfortunately for my kid brother, this nickname has stuck like glue through his entire life, even though he has a nice normal regular name. Huckleberries, popular in Montana and states nearby, are practically non-existent in New Jersey. No, scratch that…they ARE non-existent in New Jersey. 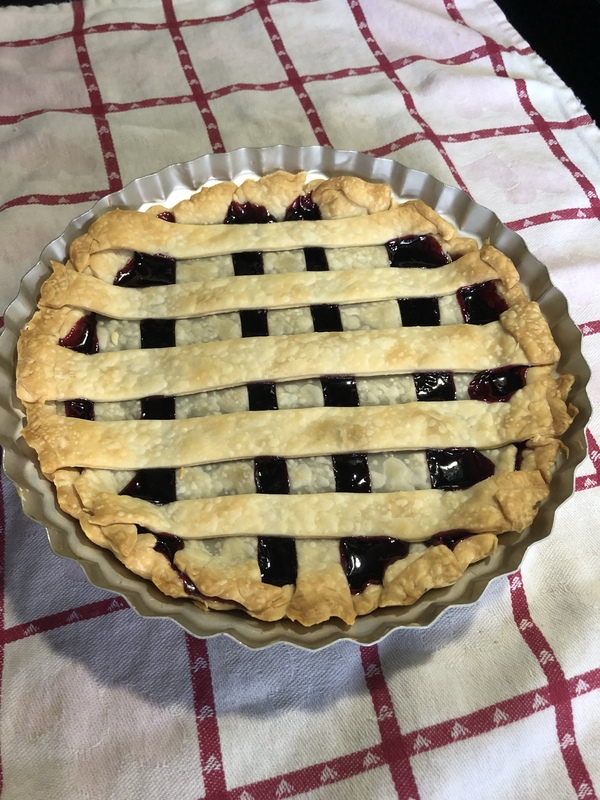 After several days of trying to locate huckleberries in nearby grocery stores and farmers’ markets, I started to scour the internet for huckleberries. And I found them. For something like $35 a pound. Yikes. There was no way I was buying them. Montana is a ways away apparently. I ordered the filling on the 8th and it didn’t arrive until the 21st…when we were on vacation. Hence my excuse of why it took a month to make our Montana meal. Once I had everything together, though, this was the easiest of all our state meals to make. Or rather, the easiest dessert to make. 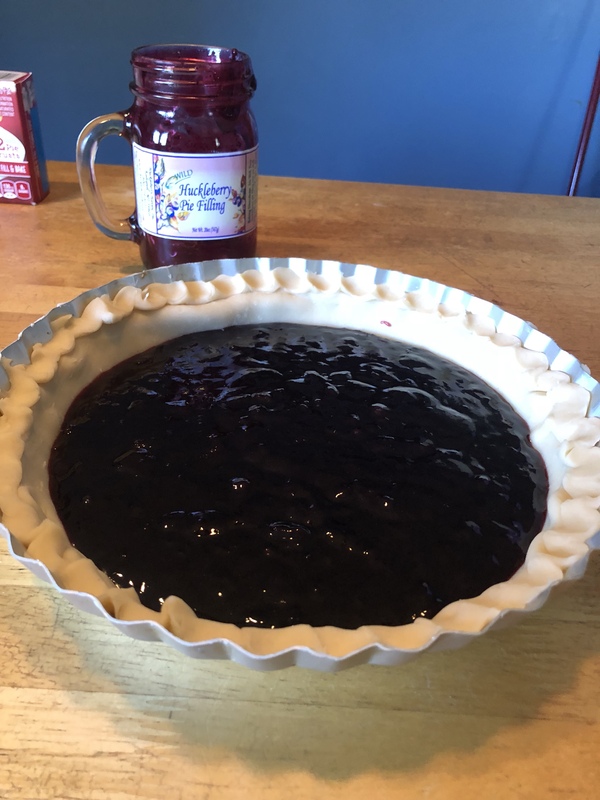 As much as I wanted to try some huckleberry buckle (crumb cake with huckleberries in it) or huckleberry cheesecake, all of those recipes required fresh huckleberries. 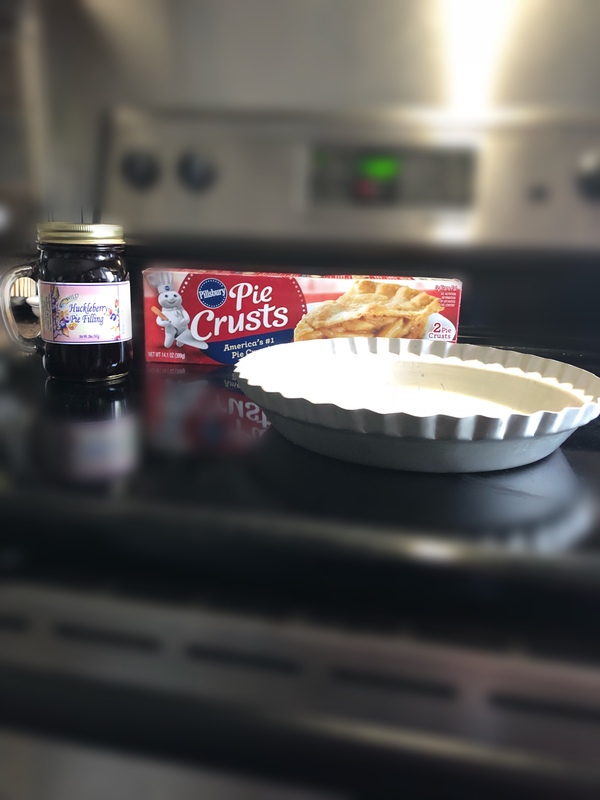 Since the pie filling already had sugar and other ingredients in it, I didn’t know how it would taste or how to adjust the recipe if I used it. 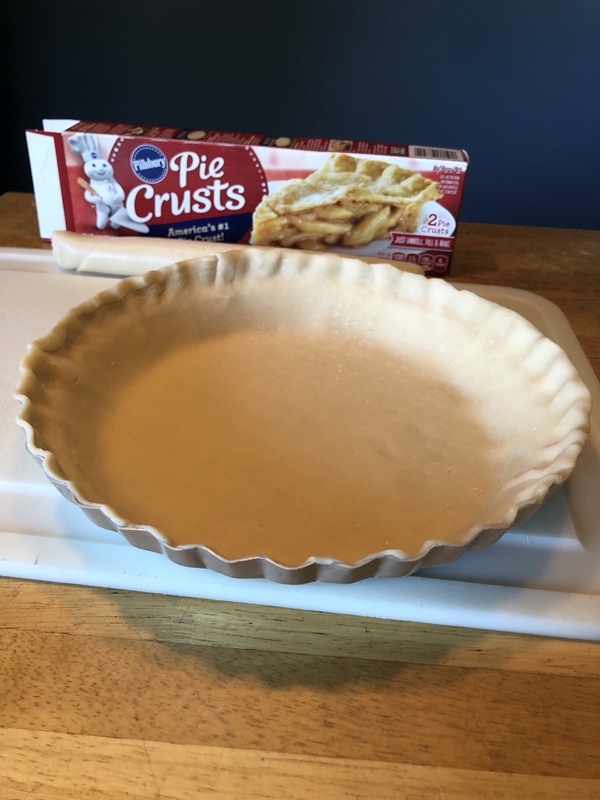 I was a little disappointed that the pie filling definitely did NOT fill the bottom crust. I’m pretty sure it’s the pie plate since I had this same problem when I made an apple pie. Maybe the pie plate I’m using is exceptionally large? 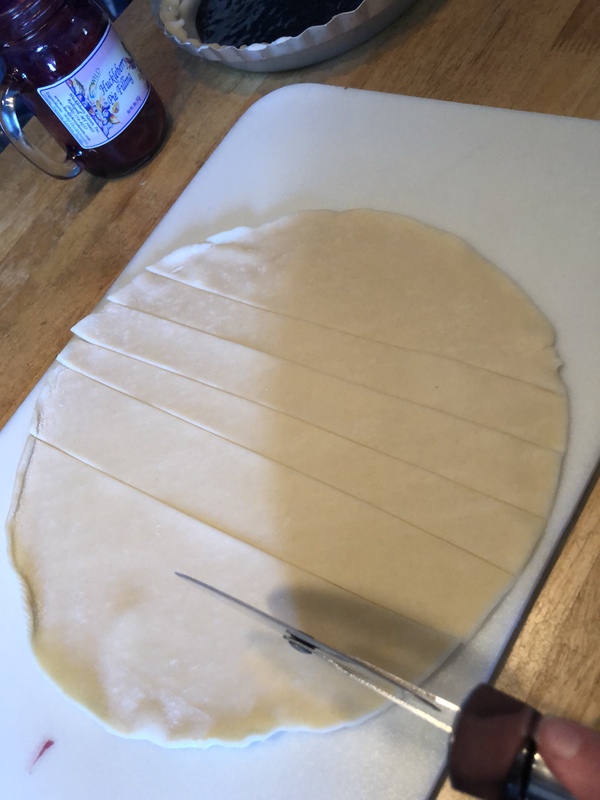 At any rate, I had to push the sides down a bit, but this may have affected the finished product. 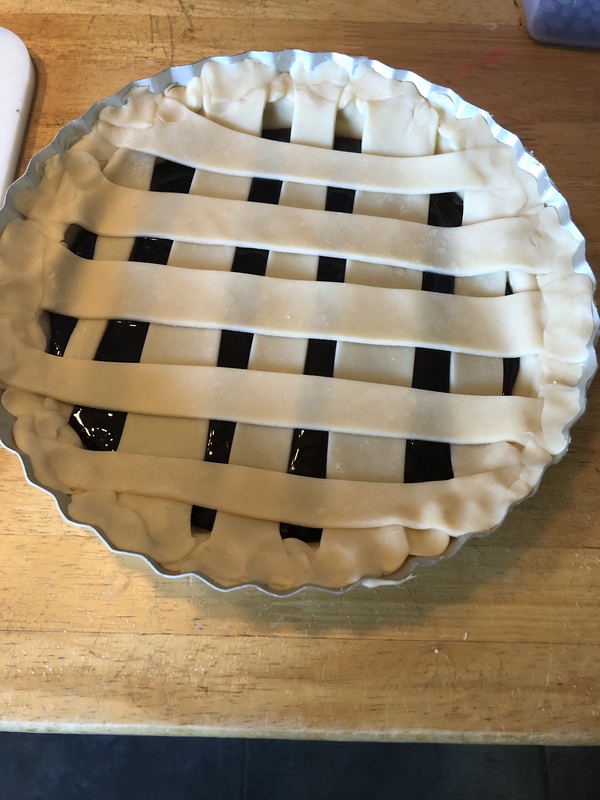 Since the pie was so simple to make, I figured I’d put some effort into the pie and try my hand at a lattice crust. Then came time to cut it. What a disaster. 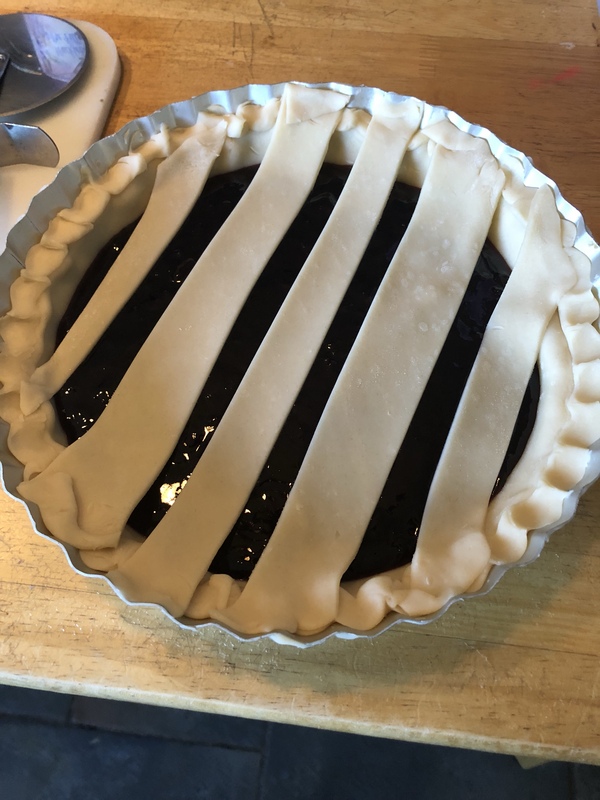 The pie piece came out flat and the filling seeped out—I’ve got to figure out what I’m doing wrong here. It’s probably the damn oven. Still, it doesn’t matter how it looks, right? All that matters is the taste. 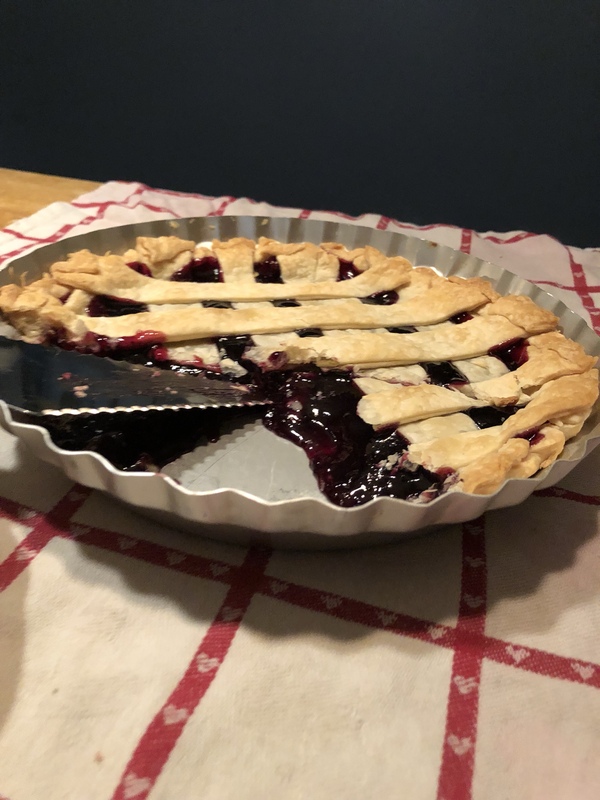 So what did we think of our first taste of huckleberries? Not what I was expecting! Wow, was that sweet! 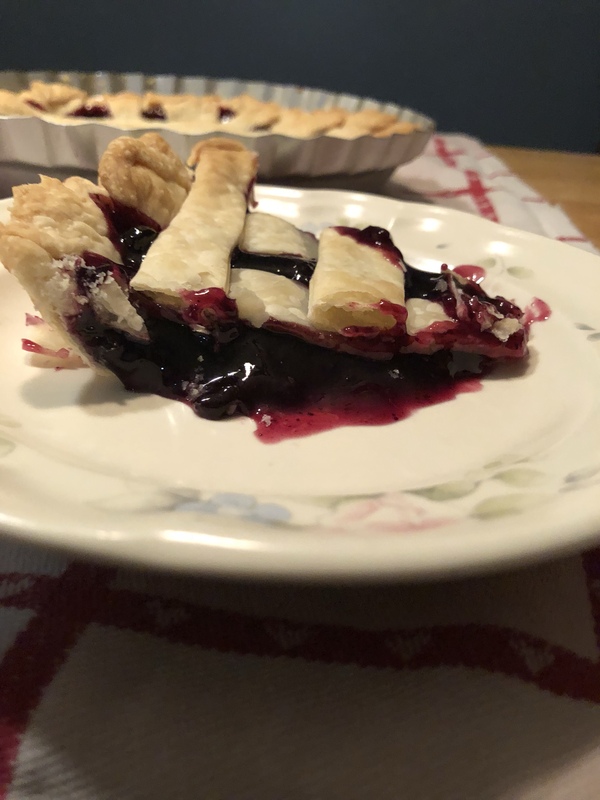 It tasted like a pie crust with grape jelly in it. Too much for me…and apparently Kid #2 as well. Hubby took a lick off the fork and turned his nose up at it as well and Kid #1 refused to even try it. There goes a month of planning and $25 to make a pie down the drain. The only saving grace is that it was simple to make. Oh well. Fingers crossed that our next state meal will be a success…we’re getting down to the last few states out of 50.